There are few things in life as intimidating as buying your first house. The knowledge needed to buy your first home will include learning about several different professional industries; including the mortgage, real estate, inspection, appraisal, title, and insurance industries. 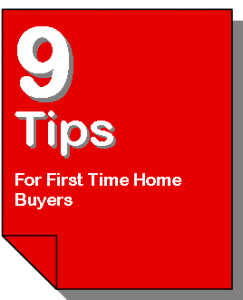 This article will give you an in-depth look at the home buying process, and help relieve some of the tension that you may feel as you venture through the home buying process for the first time. A good REALTOR® is your best resource to help avoid issues that might jeopardize your home purchase. They will walk you through each step below and make sure that nothing is overlooked. In order to purchase a house, you will need to know how you are paying for it. Since this will most likely be the largest monetary transaction in your lifetime up to this point, it’s highly probable that you will need to get a mortgage to pay for your first house. This may seem like common sense, but every Realtor® has had those buyers who send them a list of homes to look at before they have even thought about this step… Yes, it happens often. People want to go out and look at homes before they deal with their finances because looking at homes is much more fun that talking to a mortgage lender, but it’s not the right way to start off. At HomesInTheFoxValley.com, we ready to coordinate the smoothest transaction possible. Buying or Selling a home takes time and energy, but it’s extremely rewarding. After you’ve signed the papers at closing, all of our hard work will have paid off, and you will feel that wave of excitement as you move in your new home, or on to your next home! The information on this website is deemed accurate but is not guaranteed.